I’m not going to lie, I love a good meal. I can eat as much as Kyle (the BF) and he’s double my size. Perhaps being blessed with a high metabolism has made me love food even more. I’ve always been a fan of dining out, trying new restaurants and cuisines in the city and let’s face it, there are some meals you just can’t make yourself (how much I’d love to have a sushi chef at home 24 hours a day). However, ever since we’ve moved into our house (trying to replenish the piggy bank) and also wanting to keep fit and healthy, we’ve been staying in and cooking at home a lot more often. 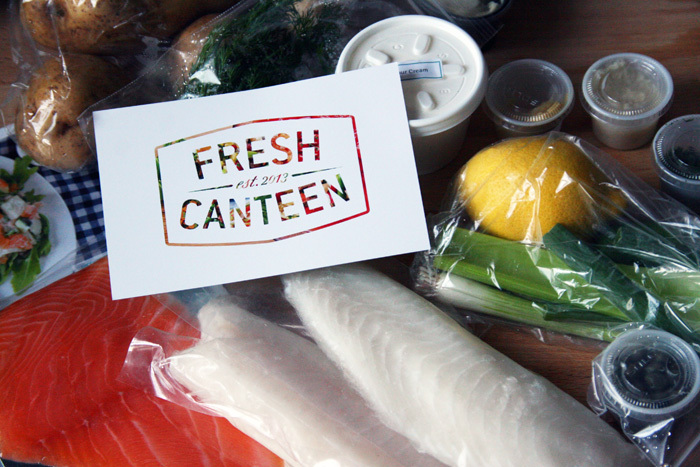 I discovered Fresh Canteen, offering amazing healthy recipes and fresh ingredients delivered right to your doorstep. This is a great option for those nights where you want to stay in, have a great (fresh) meal without having to make a trek to the store. 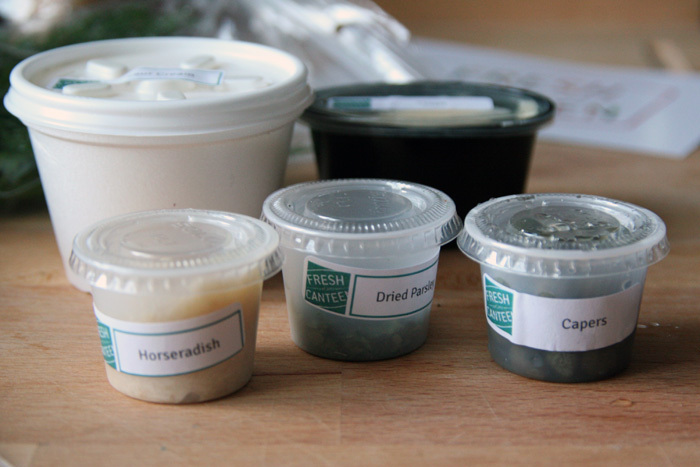 Earlier this week, Fresh Canteen delivered a refrigerated box to my door step. 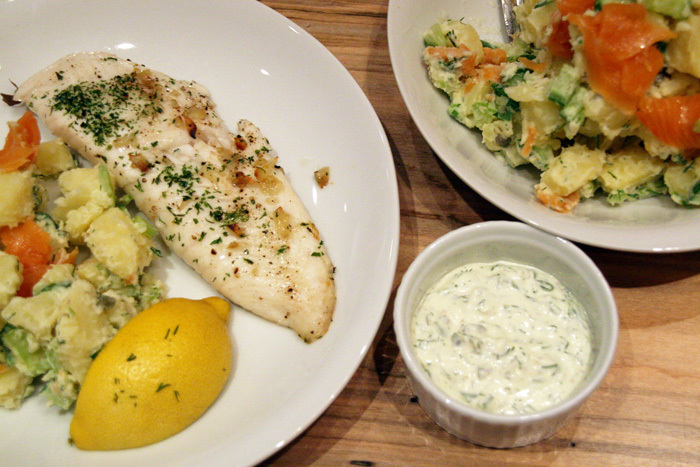 When I arrived home, all I had to do was pop open the box (all the ingredients are already prepared), follow the simple recipe card, and in under 35 minutes, we had fantastic Tilapia Fillets paired with Smoked Salmon Dill Potato Salad. 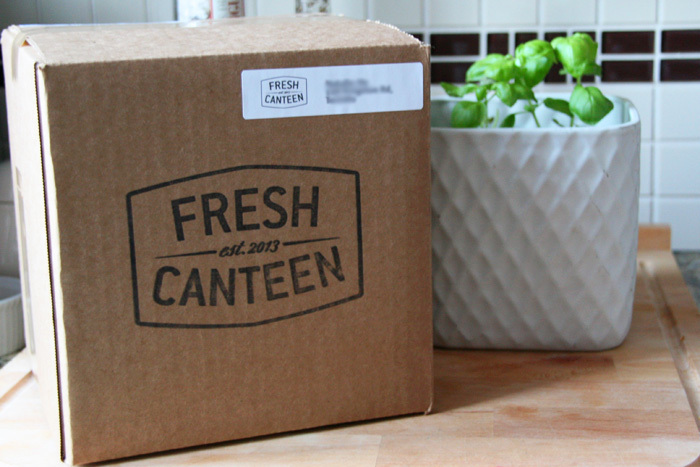 Fresh Canteen currently offers delivery in most of Greater Toronto Area. Their meals start at $12.50 per person (read more on How it Works) which definitely beats the price of eating an equivalent meal at a restaurant. 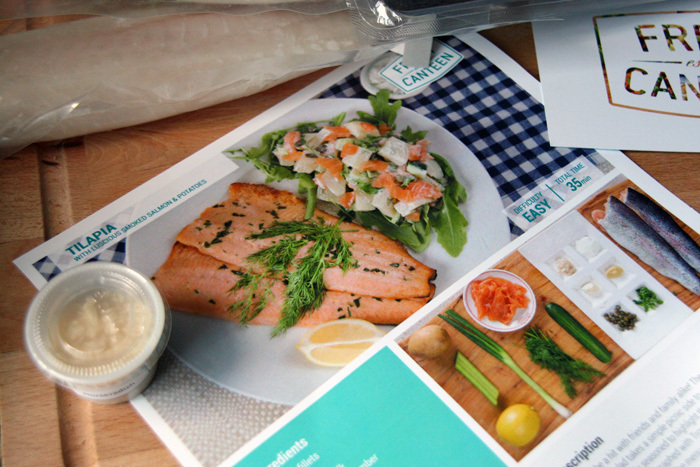 6 recipes are available each week (these change on a weekly basis), you can select the recipes you want, and every Tuesday between 12 – 6 p.m., deliveries are made. I urge you to give it a try, I also think these would be a fantastic gift idea for that urbanite who wants to cook at home! Perhaps an early Valentine’s Day surprise?